How An Oil Spill Spread Into A National Crisis More than two weeks have passed since an oil rig exploded in the Gulf of Mexico, killing 11 people and touching off a major environmental disaster. The story, which began far from land, now stretches along the Gulf Coast and all the way to Washington. Here, a detailed look at the crisis as it unfolded. 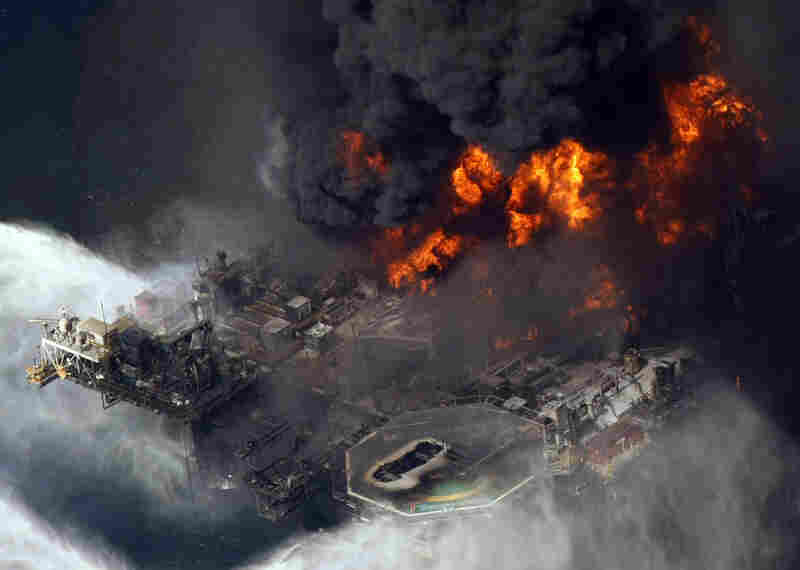 The Deepwater Horizon oil rig is seen burning in this April 21 file photo taken in the Gulf of Mexico. It began in the dark of night when an explosion rocked the offshore drilling rig the Deepwater Horizon at 10 p.m. on Tuesday, April 20. Coast Guard helicopters and boats were deployed to pluck survivors from the Gulf. They rescued 115 workers and then continued a frantic search for 11 missing men as the rig burned through the night and into the next day. April 20: Deepwater Horizon drilling rig explodes off Louisiana coast. The Coast Guard responds with a search-and-rescue mission. More than 100 workers are rescued. Eleven workers missing and presumed dead. April 21: Deputy Interior Secretary David Hayes is dispatched to the Gulf to coordinate the government's response. April 22: The rig sinks. President Obama briefed in the Oval Office by members of his Cabinet and other advisers, including Homeland Security Secretary Janet Napolitano, Coast Guard Adm. Thad Allen, Interior Secretary Ken Salazar and economic adviser Larry Summers. The government is monitoring the spill, but the focus is still largely search and rescue. April 23: Coast Guard Rear Adm. Mary Landry says no oil appears to be leaking from the undersea wellhead or at the water's surface. April 24: Leak reported; oil is estimated to be leaking at the rate of 1,000 barrels a day. April 27: Obama travels to Iowa for start of a two-day Midwestern tour. April 29: Coast Guard says leak may be five times greater than earlier estimate: 5,000 barrels a day. Louisiana Gov. Bobby Jindal declares state of emergency. Napolitano declares this a "spill of national significance," allowing additional resources to flow to the Gulf from around the country. April 30: Napolitano and Salazar visit the Gulf region. Obama says he continues to believe in increased domestic oil production but adds it must be done "responsibly" to protect both workers and environment. May 1: Allen, the Coast Guard commandant, is named national incident commander. May 2: Obama visits Coast Guard station in Venice, La. 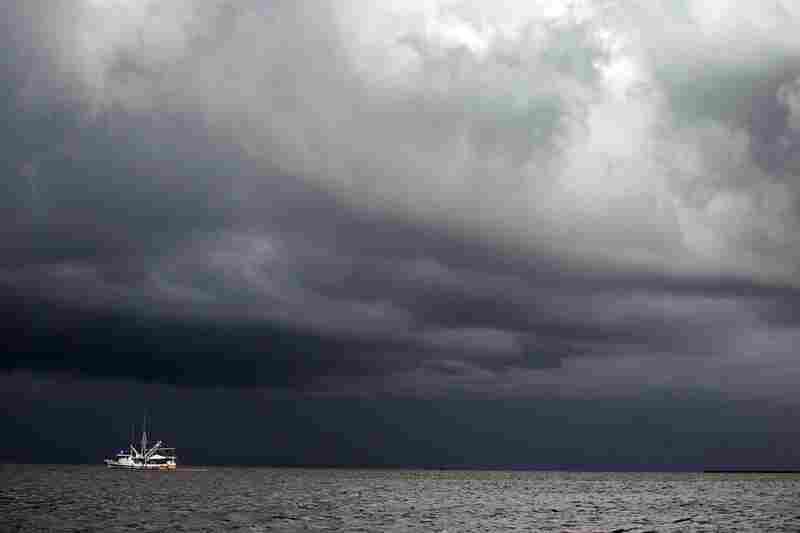 Federal government bans fishing for at least 10 days in a large swath of the Gulf between the mouth of the Mississippi River and Pensacola Bay. 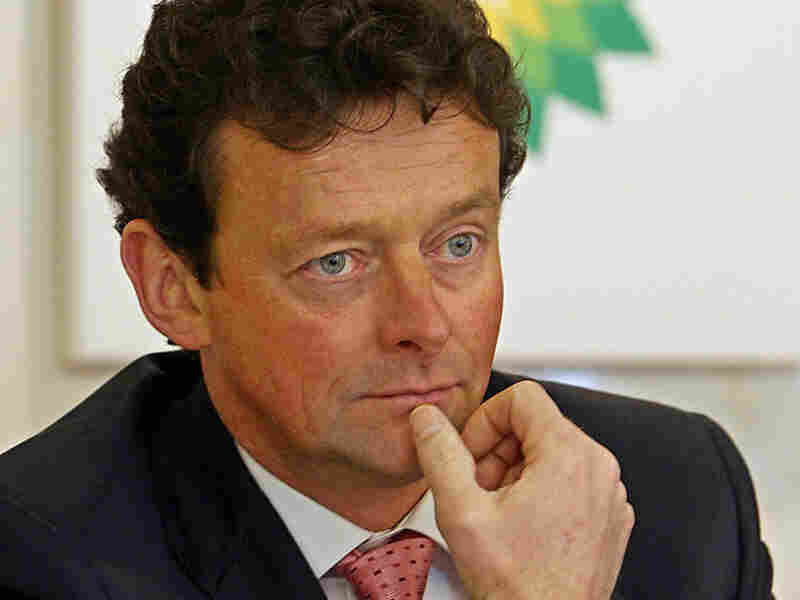 May 3: BP CEO Tony Hayward tells NPR his company will pay for the cleanup and any "legitimate" legal claims. "It is a very dramatic fire, and you can see it's, you know, big plumes of fire smoke. You can actually see it from satellite imagery," Senior Chief Petty Officer Mike O'Berry said at the time. The next day, the burning rig was toppling. The rig — which is owned by the offshore drilling contractor Transocean but is leased to BP, which owns the mineral rights to the oil below — was not pumping oil when the accident happened, said Transocean Vice President Adrian Rose. "The operation on the rig immediately prior to the incident was running and cementing a production casing. This was conducted according to plan with appropriate testing completed and with no indication of any problems," Rose said. On Thursday, April 22, there was a second explosion and the Deepwater Horizon started its plunge nearly a mile to the ocean floor. The Coast Guard and BP said they were preparing for a worst-case scenario but didn't believe any oil was leaking. Some 50 miles away in southern Louisiana, there was an outpouring of support for the families of the missing workers — but little expectation of the nightmare to come. To hear President Obama and his aides tell it, the administration instantly grasped the severity of what had happened. "I want to emphasize, from Day 1, we have prepared and planned for the worst," Obama said. But given the crush of other White House business, there's little sign the administration grasped — at least initially — just how serious this accident would become. On the night the rig exploded, the president had just returned from a West Coast fundraising trip. He was preparing to meet the next day with Senate leaders to discuss his next Supreme Court pick, and the following day, he headed to New York for a major speech on financial regulation. On the way to New York, White House press secretary Robert Gibbs was asked if the president had spoken to anyone about the burning oil rig. Gibbs said he didn't think so. By the time the president returned from New York, though, the rig had sunk. And White House involvement increased sharply. 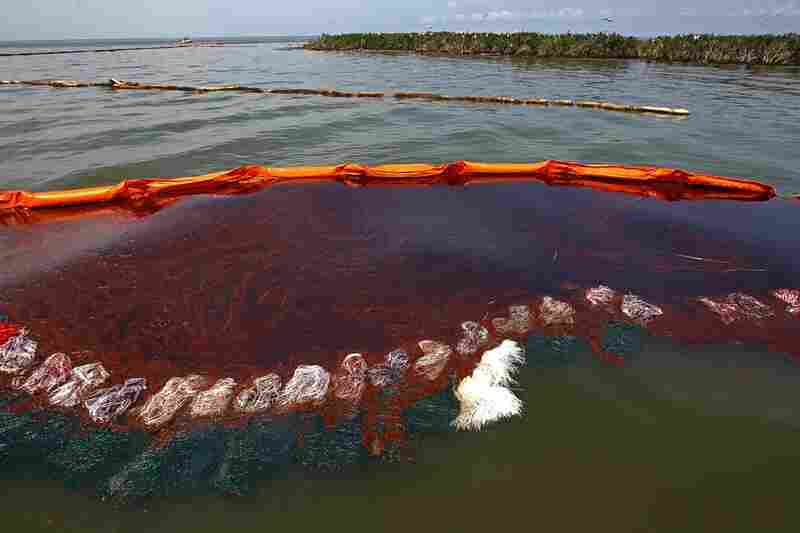 A boat uses a boom and absorbent material to soak up oil in Cat Bay, near Grand Isle, La., on June 28. 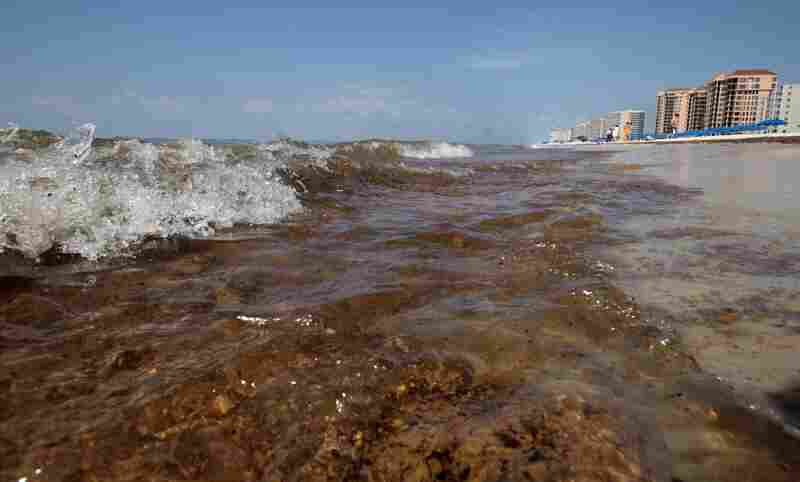 A tropical storm is expected to hit the Gulf and impede cleanup efforts. Florida Gov. 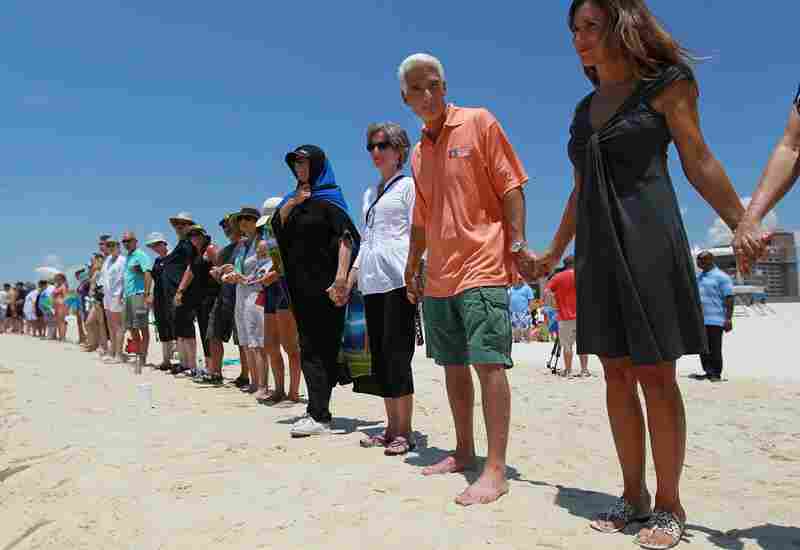 Charlie Crist and wife Carole Rome Crist (right) stand with others during a Hands Across the Sand event June 26 in Pensacola, Fla. The event was staged across the nation to protest offshore oil drilling. Oil clouds the surface of Barataria Bay near Port Sulpher, La., on June 19. 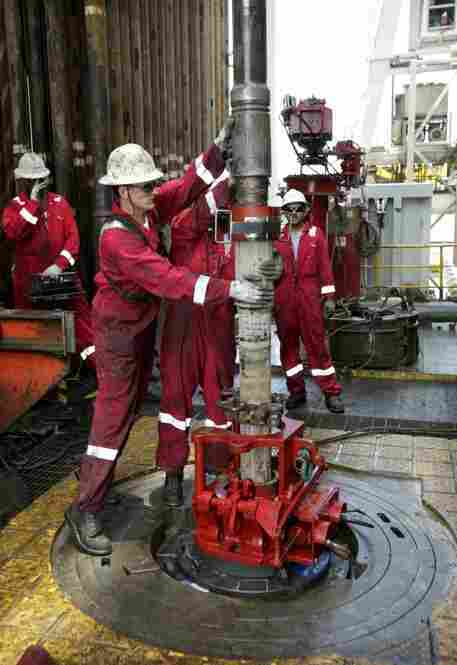 Workers adjust piping while drilling a relief well at the site of the Deepwater Horizon oil spill. 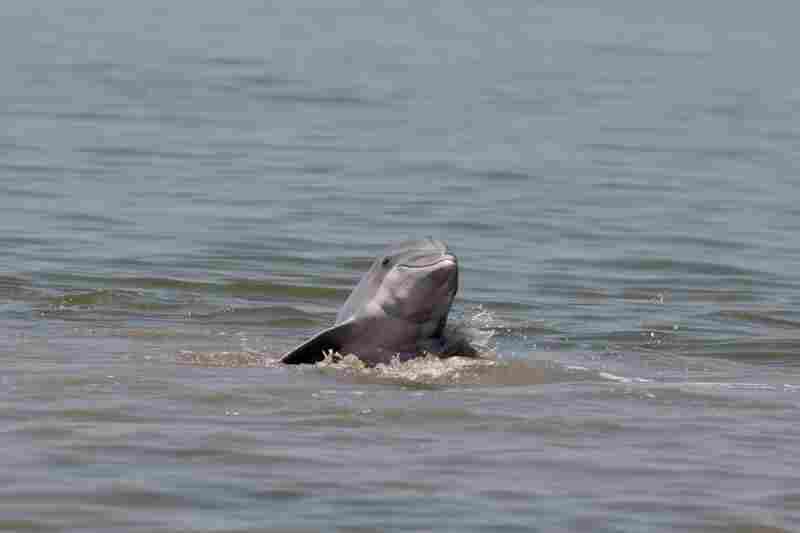 A dolphin rises up out of the water near Grand Terre Island off the coast of Louisiana on June 14. President Obama stands with Mississippi Gov. Haley Barbour (right) and Gulfport, Miss., Mayor George Schloegel after meeting with residents affected by the oil spill. 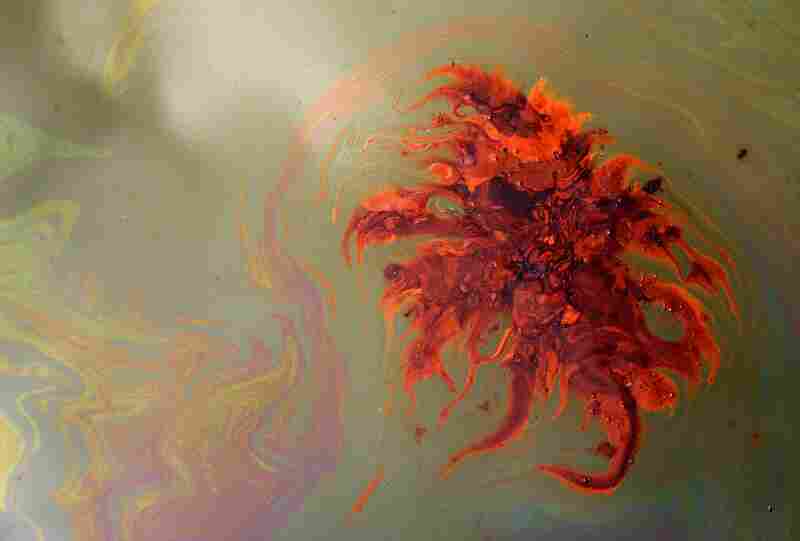 Crude oil washes ashore in Orange Beach, Ala., on June 12. Oil slicks, 4 to 6 inches thick in some parts, have washed up along the Alabama coast. 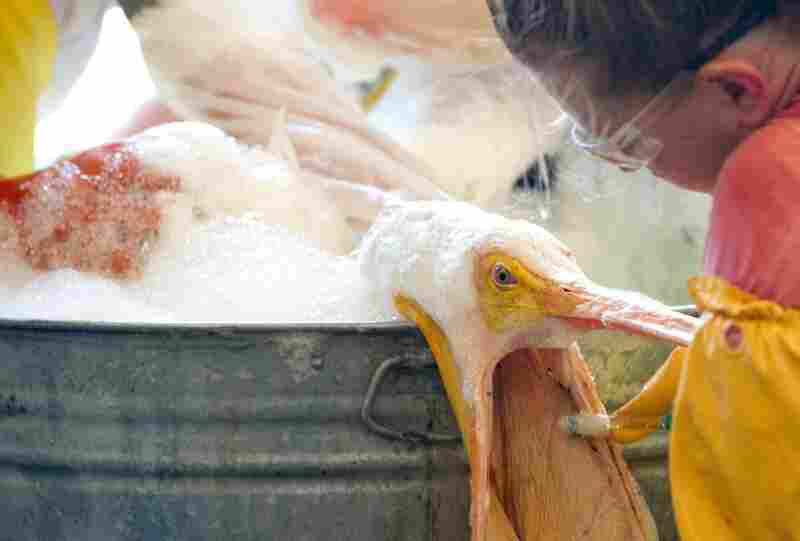 A volunteer uses a toothbrush to clean an oil-covered white pelican at the Fort Jackson Oiled Wildlife Rehabilitation Center in Buras, La., June 9. 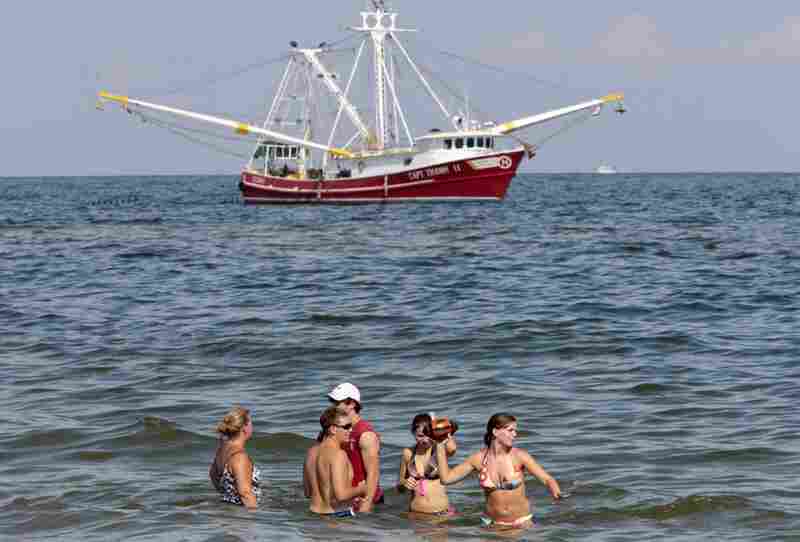 A shrimp boat skims oil from the surface of the water just off Orange Beach, Ala., as a family enjoys the surf. Oily tar balls have started washing up on Orange Beach and beaches in the western Florida panhandle. 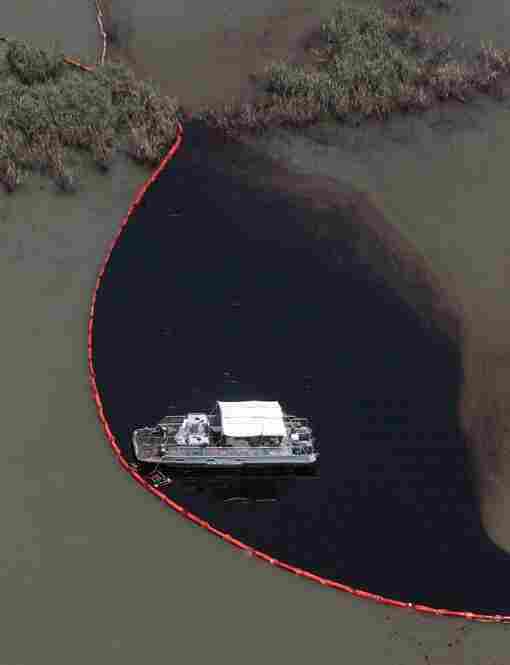 Sand from a dredge is pumped onto East Grand Terre Island, La., to provide a barrier against the Deepwater Horizon oil spill, June 8. 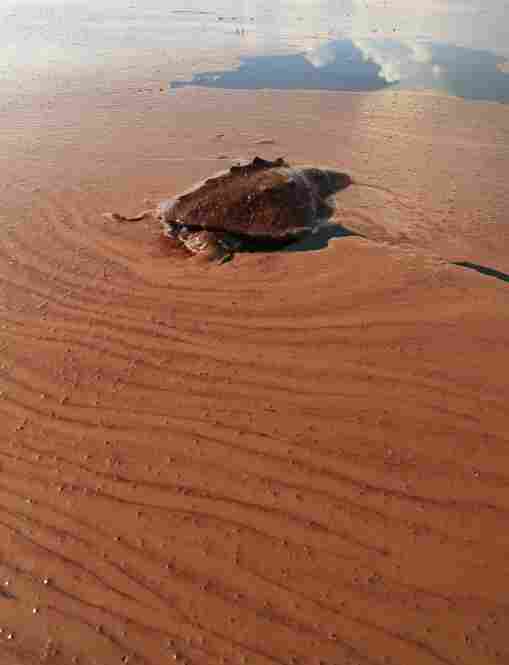 A dead turtle floats on a pool of oil from the Deepwater Horizon spill in Barataria Bay off the coast of Louisiana on June 7. 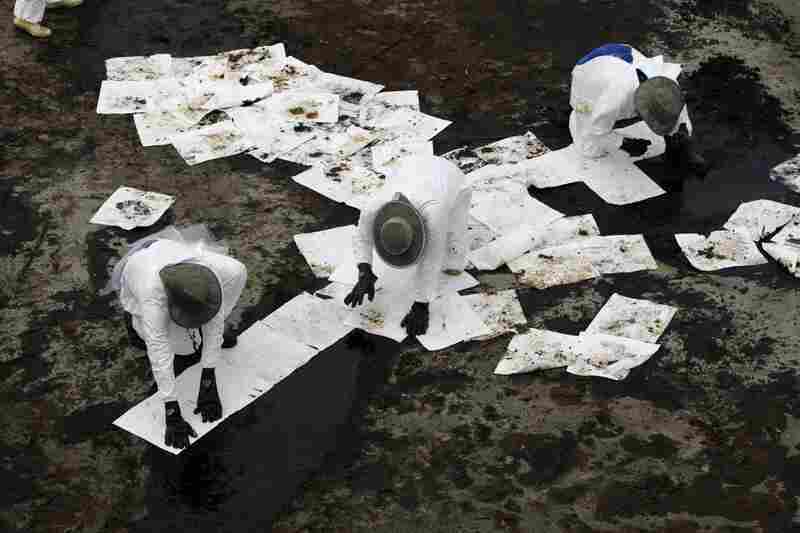 Workers use absorbent pads to remove oil that has washed ashore from the spill in Grand Isle, La., June 6. Plaquemines Parish coastal zone director P.J. 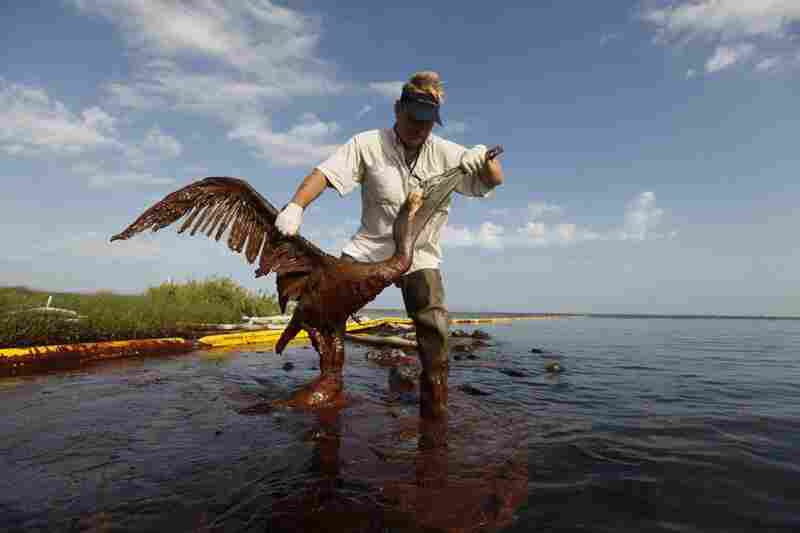 Hahn lifts an oil-covered pelican out of the water on Queen Bess Island in Plaquemines Parish, La., June 5. Heavy oil pools along the side of a boom just outside Cat Island in Grand Isle, La., June 6. 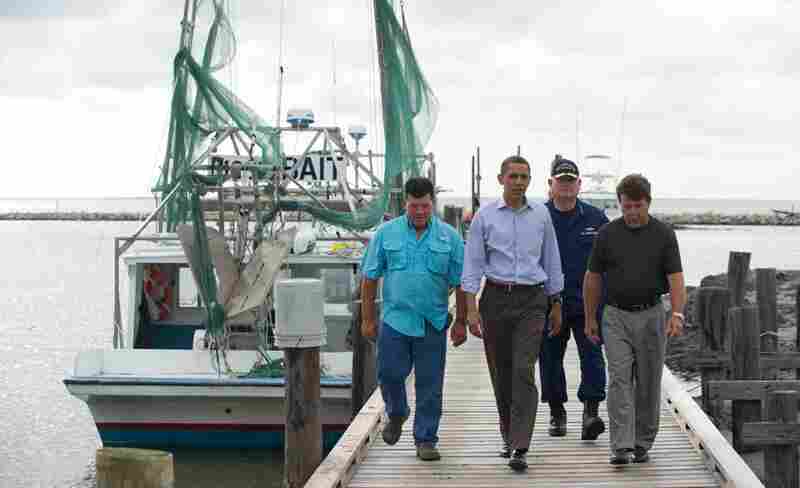 President Obama walks alongside Grand Isle Mayor David Camardelle (from right), U.S. Coast Guard Adm. Thad Allen, who is in charge of the federal response to the spill, and Chris Camardelle after meeting with local business owners in Grand Isle, La., June 4. 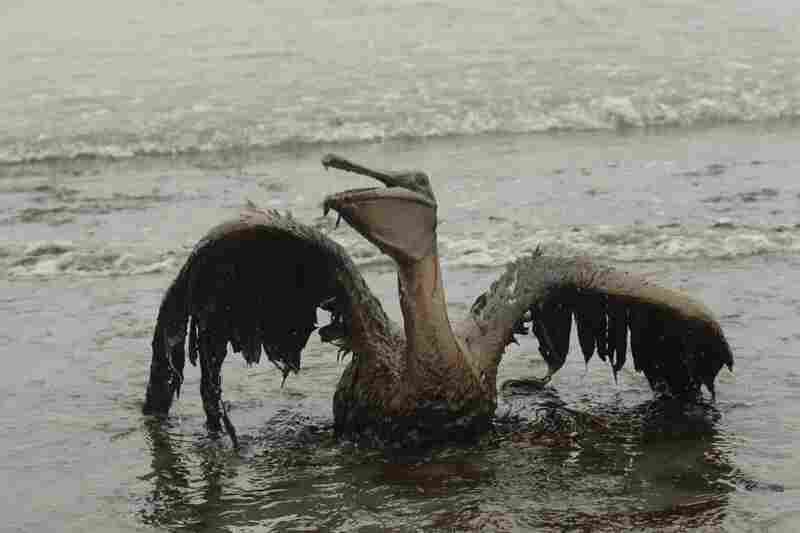 A brown pelican sits on the beach at East Grand Terre Island along the Louisiana coast after being drenched in oil from the BP Deepwater Horizon oil spill, June 3. U.S. Attorney General Eric Holder announces that the Justice Department has launched a criminal investigation into the BP oil spill. 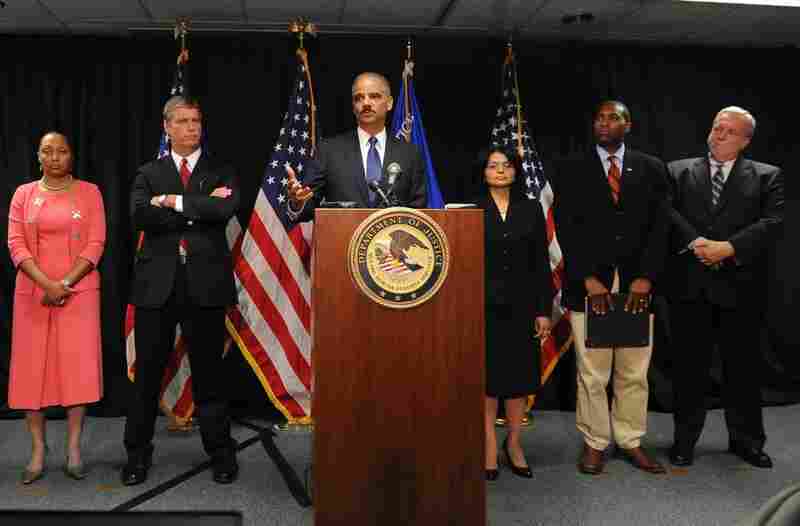 With him, from left: Stephanie Finley and Jim Letten, U.S. attorneys for the Western District of Louisiana; Ignacia Moreno, assistant attorney general for the Environment and Natural Resources Division; Tony West, assistant attorney general, Civil Division; and Don Burkhalter, U.S. attorney for the Southern District of Mississippi. 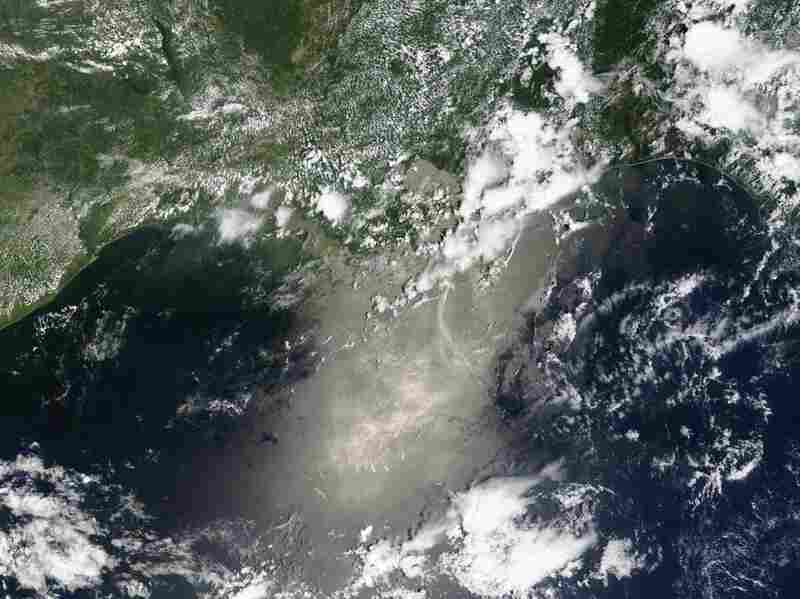 The oil slick off the coast of Louisiana, seen from above. 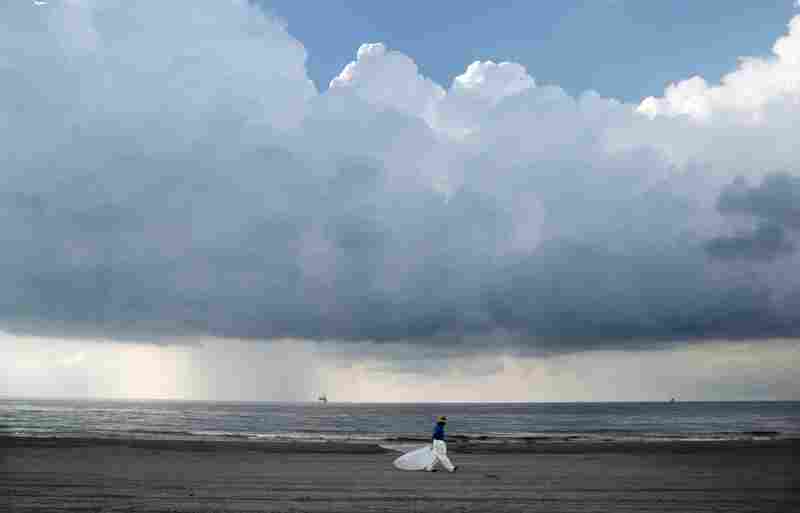 A worker leaves the beach in Grand Isle, La., on May 30. BP is turning to yet another mix of undersea robot maneuvers to help keep more crude oil from flowing into the Gulf. Protesters cover themselves with a water and paint mixture during a demonstration at a BP gas station in New York City on May 28. Workers clean up oil in Pass a Loutre, La. The latest attempt to plug the leak was unsuccessful. 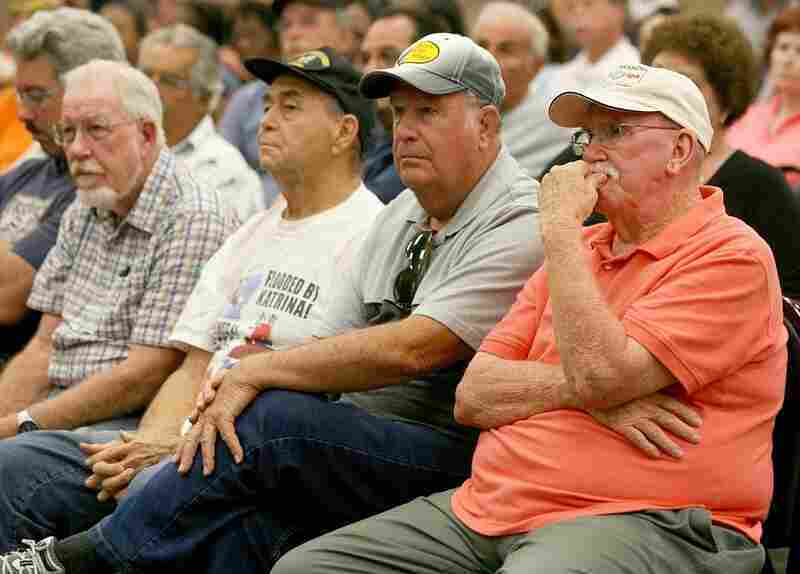 Residents listen to a discussion with parish officials and a BP representative on May 25 in Chalmette, La. Officials now say that it may be impossible to clean the hundreds of miles of coastal wetlands affected by the massive oil spill. 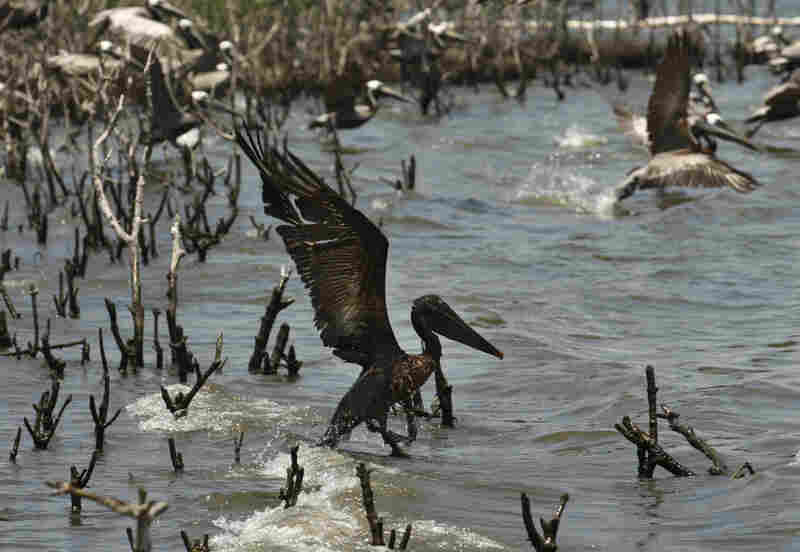 An oil-soaked pelican takes flight after Louisiana Fish and Wildlife employees tried to corral it on an island in Barataria Bay on the coast of Louisiana. The island, which is home to hundreds of brown pelican nests as well at terns, gulls and roseate spoonbills, is impacted by oil from the Deepwater Horizon spill. A sign warns the public to stay away from the beach on Grand Isle, La. 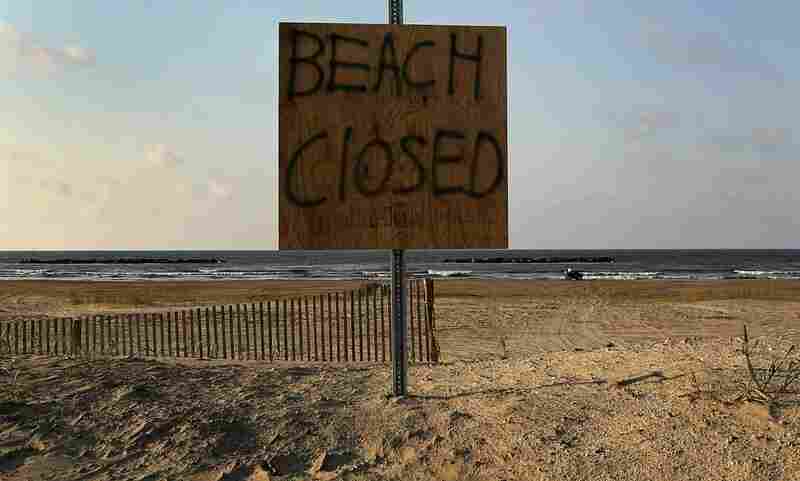 Officials closed the oil-covered beaches to the public indefinitely on Saturday. 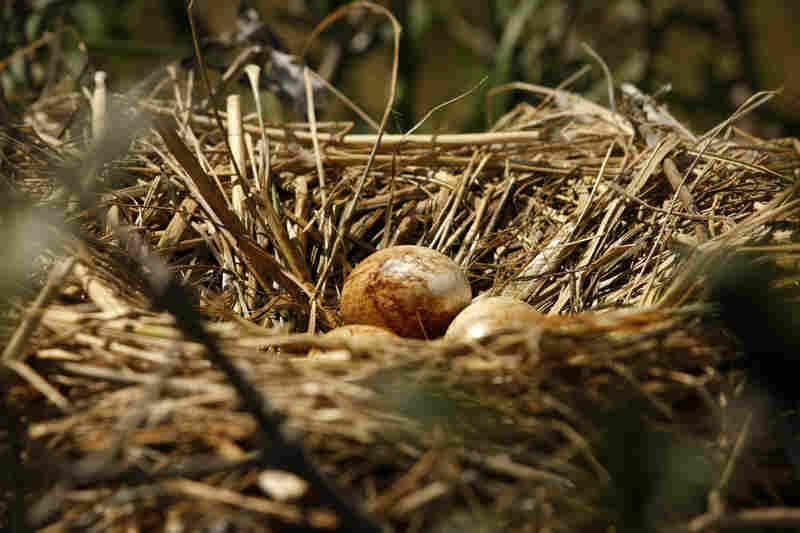 Pelican eggs stained with oil sit in a nest on an island in Barataria Bay on May 22. A bird flies over oil that has collected on wetlands on Elmer's Island in Grand Isle, La., May 20. 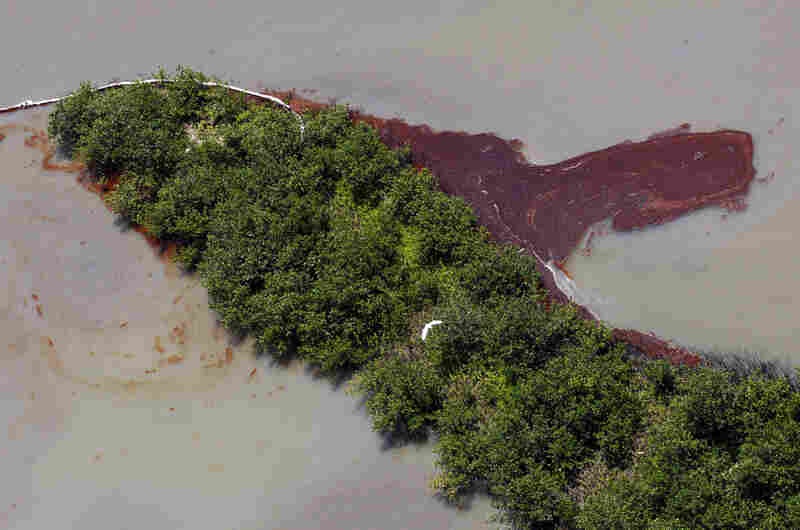 The oil came inland despite oil booms that were placed at the wetlands' mouth on the Gulf of Mexico. 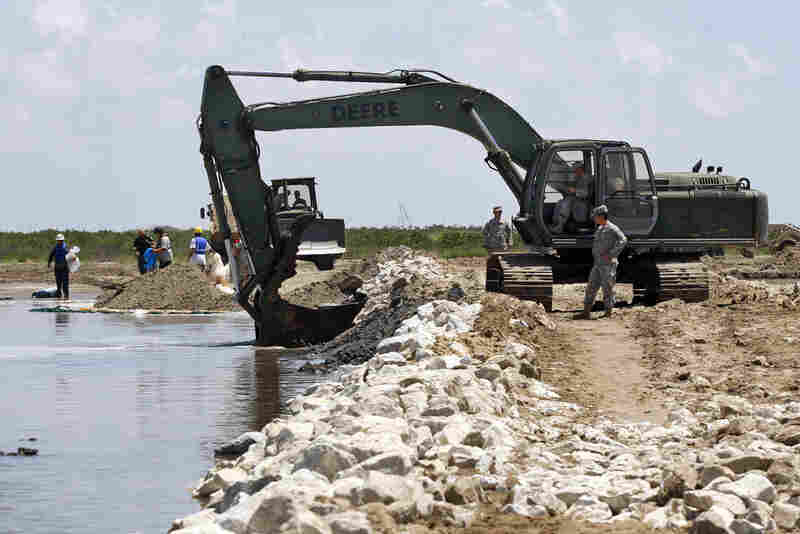 Members of the Louisiana National Guard build a land bridge at the mouth of wetlands on Elmer's Island. 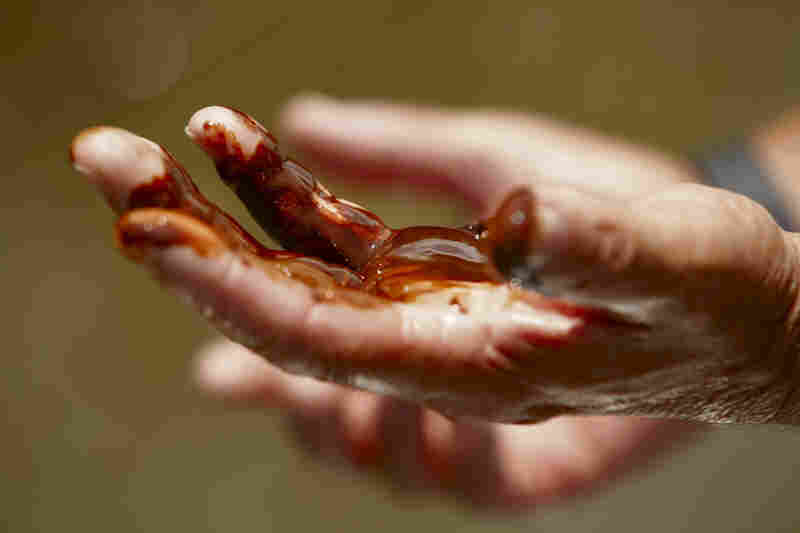 The hands of boat captain Preston Morris are covered in oil after collecting surface samples from the marsh of Pass a Loutre, La., on May 19. Louisiana Gov. 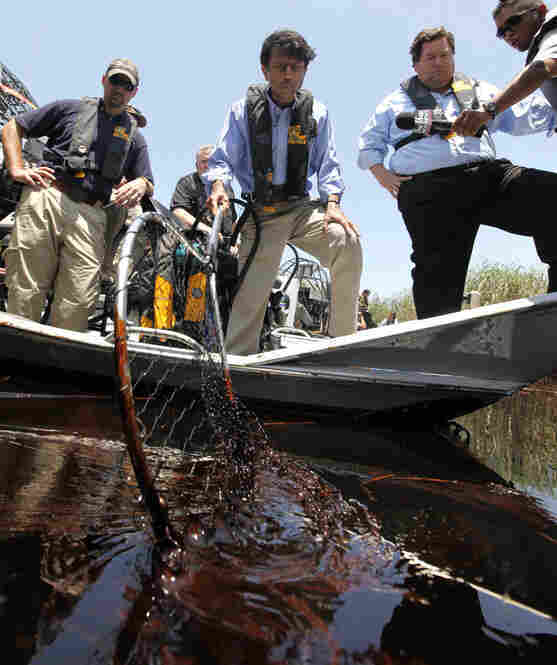 Bobby Jindal (center) and Plaquemines Parish President Billy Nungesser (right) tour the oil-impacted marsh of Pass a Loutre, La. "This is the heavy oil that everyone's been fearing that is here now," said Jindal. 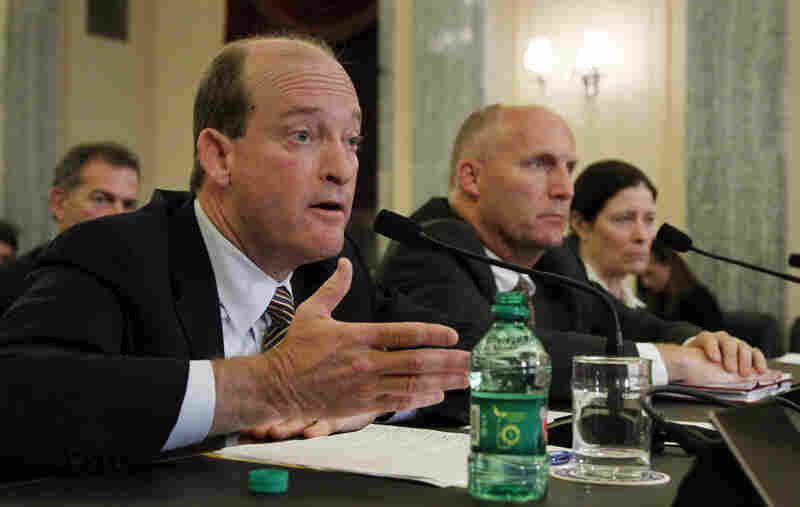 BP Chairman and President Lamar McKay (left), with Transocean President and CEO Steven Newman (center) and Applied Science Associates Principal Deborah French McCay, testifies during a Senate Committee on Commerce, Science, and Transportation hearing May 18 on response efforts to the Gulf Coast oil spill. This undated frame grab image received from BP and provided by the Senate Environment and Public Works Committee shows details of the oil spill in the Gulf of Mexico. BP has agreed to display a live video feed of the oil gusher on the Select Committee on Energy Independence and Global Warming Committee's website beginning Thursday evening. 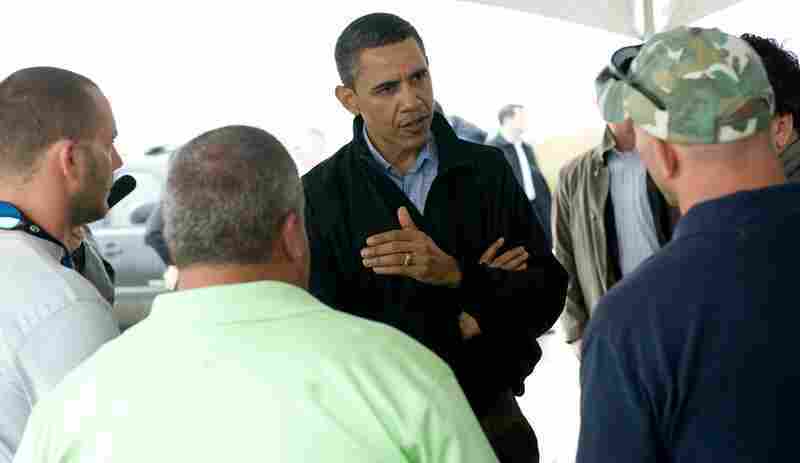 President Obama speaks with local fishermen about how they are affected by the oil spill in Venice, La., on May 2. Danene Birtell with Tri-State Bird Rescue and Research tends to a Northern Gannet in Fort Jackson, La., on April 30. 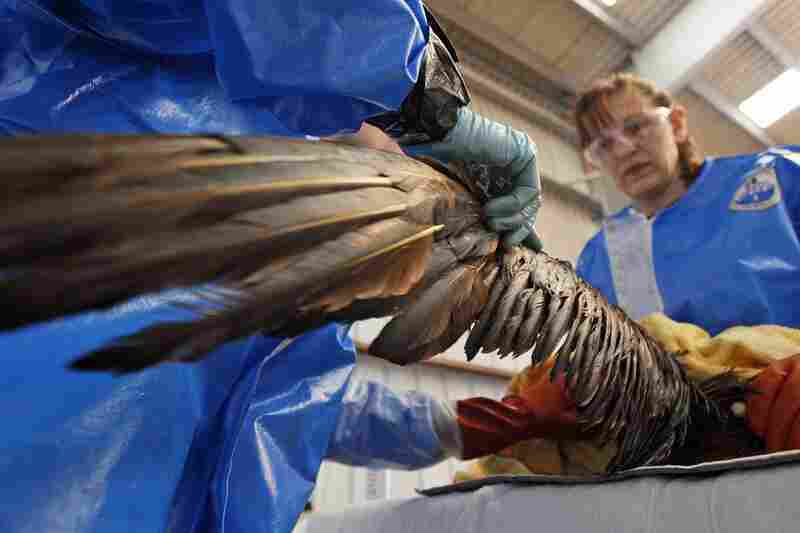 The bird, normally white when full grown, is covered in oil from the oil spill. Since the explosion, a third oil leak has been discovered in the blown-out well. 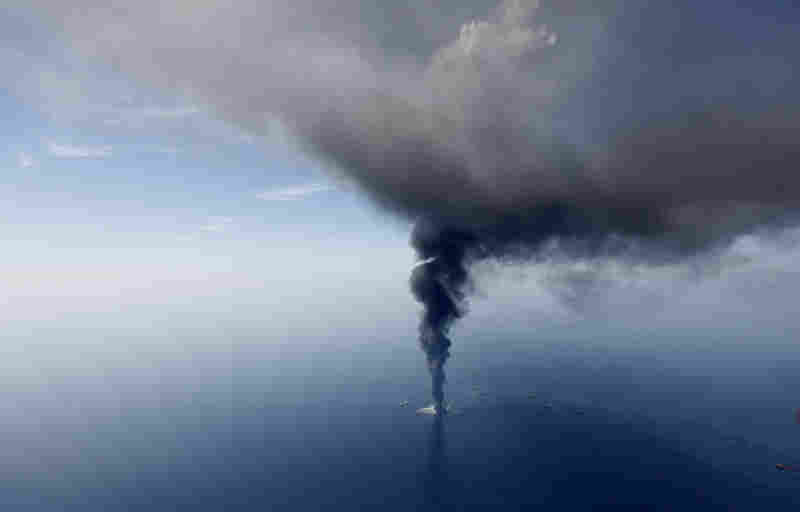 In this aerial photo taken April 21 more than 50 miles southeast of Venice, La., the Deepwater Horizon oil rig burns. 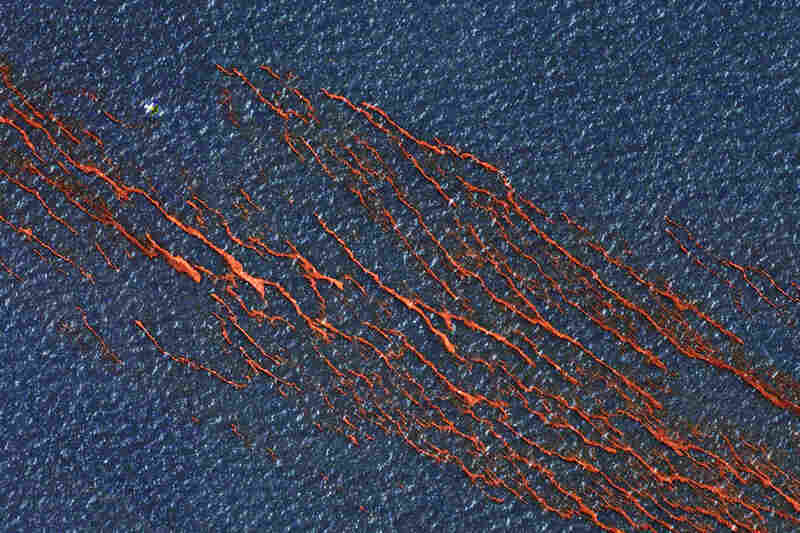 Tendrils of oil mar the waters of the Gulf of Mexico in this satellite image taken Monday. An estimated 5,000 barrels of oil a day are seeping into the Gulf, after an explosion last week on a drilling rig about 50 miles off the Louisiana coast. Obama huddled in the Oval Office with his Homeland Security and Interior secretaries, as well as Coast Guard Commandant Thad Allen. The president ordered government agencies to put a priority on search and rescue, and on environmental cleanup. Afterward, he stepped outside into the Rose Garden for a reception marking the 40th anniversary of Earth Day. The president discussed his own efforts to pass a comprehensive energy and climate bill. As part of that effort, he had proposed an expansion of offshore oil drilling just a month earlier. "It turns out, by the way, that oil rigs today generally don't cause spills," Obama had said on April 2. "They are technologically very advanced. Even during Katrina, the spills didn't come from the oil rigs. They came from the refineries on shore." That confidence may have bred complacency in the wake of the Deepwater Horizon's sinking. Asked on Friday, April 23, if the president was rethinking his drilling proposal, Gibbs said the latest White House information was that no oil was leaking from the underwater well. With that assurance, the president left Washington for a short vacation in North Carolina. That weekend, it turns out, the well did leak. That advanced technology Obama spoke about had malfunctioned. A device called a blowout preventer failed to clamp off the flow of oil like it was designed to do in just such an accident. BP deployed remote-controlled submarines to try to fix it. 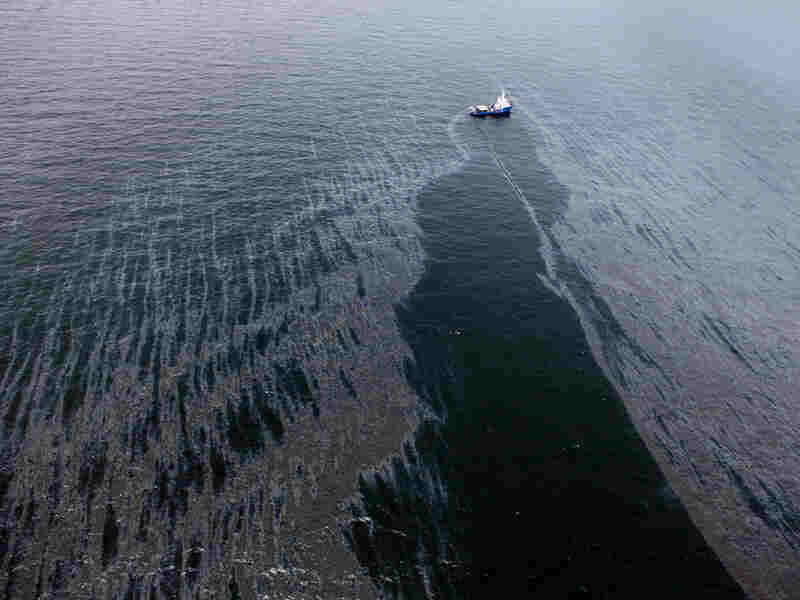 Two leaks in the riser pipe that once connected the rig to the wellhead spewed oil into the Gulf of Mexico at an estimated rate of about 1,000 barrels a day and created an oil slick bigger than Rhode Island. Gulf Coast states took notice. 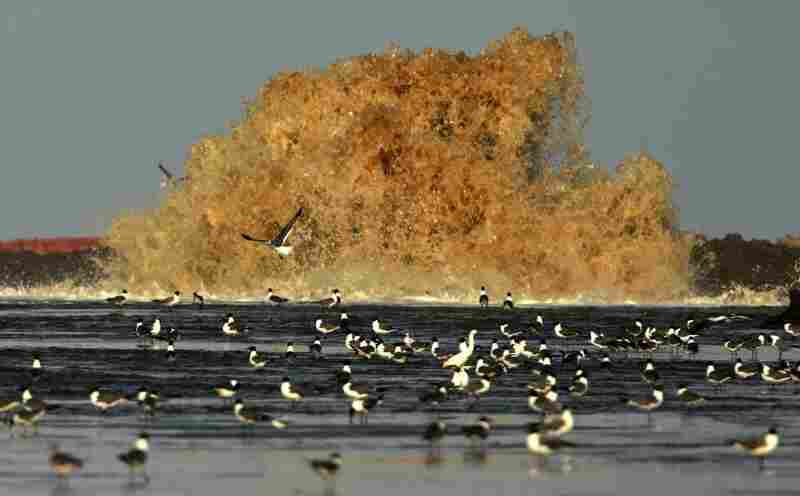 The distant accident offshore began to be a floating menace taking aim at fragile coastline. On April 30, BP Chief Operating Officer Doug Suttles said the company was doing everything it could to try to stop the flow, but added that the leak, more than 5,000 feet deep in the Gulf, was unprecedented. "These are activities that have never been accomplished before but have been used in shallower waters. And we have the world's best experts working on this 24 hours a day," Suttles said. BP prepared to drill a relief well, which will take months, and started building a structure to capture the oil below the surface. On the surface, the Coast Guard deployed booms, skimming vessels and chemical dispersants to clean up the pollution. "It is important to understand that our overarching goal remains to secure the well, fight this oil spill as far offshore as possible, and to mitigate the environmental and economic impact until such time as this incident no longer poses a threat," said Coast Guard Rear Adm. Mary Landry, who was overseeing the response. She said BP and the government were "forward-leaning." But increasingly, it appeared, they couldn't stay in front of the gusher. In the first few days of the cleanup, crews recovered just over 43,000 gallons of an oil-water mix from the surface. The well was releasing that much oil every day. 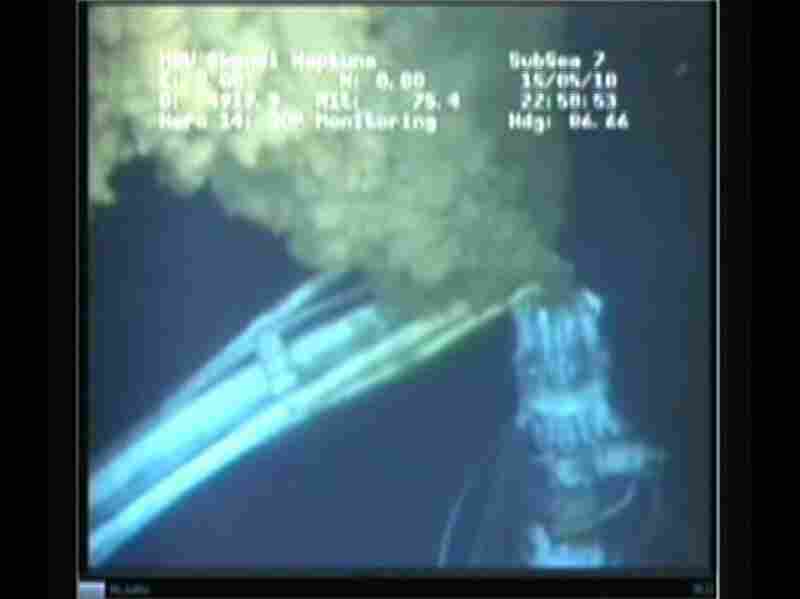 "BP has just briefed me of a new location of an additional breach in the riser of the deep underwater well. While BP believes and we believed and established a 1,000 barrel-per-day estimate in what is leaking from the well, NOAA believes the outlook could be as much as 5,000 barrels," Landry said. Obama was briefed about the worsening oil spill on Wednesday night as he flew home from a two-day trip to the Midwest devoted to clean energy. By the following morning, the administration was in full damage-control mode — in the Gulf and in the White House briefing room. "Let me start with a few words of the president's involvement. The president has been actively following the BP oil spill in the Gulf of Mexico, receiving multiple updates, and consulting on the response since the incident occurred," Gibbs said. Gibbs was surrounded by the Homeland Security secretary, the EPA administrator, and the president's energy czar. Interior Secretary Ken Salazar was in Houston, where BP has its command center. By that time, the government had grown increasingly impatient with BP and its failed efforts to stop the leak. Coast Guard Rear Adm. Sally Brice O'Hara referred to the oil company as the government's "partner," then quickly corrected herself. The company had gone from a chummy "good spiller" to a more legalistic "responsible party." The government was depending on BP to carry out the most important task of somehow shutting down the well. But as the spill was declared "nationally significant," more and more federal resources came pouring in. On May 3 at Naval Air Station Pensacola, the Coast Guard cutter Oak prepared to deploy with its Charleston, S.C.-based crew to an area close to the Deepwater Horizon accident site — on a mission to collect spilled oil. "The type of oil-skimming gear we have is called a weir skimmer," said Capt. Michael Glander. "If you can imagine a deep, dish-shaped object about the size of a truck tire, it sits on the surface of the water, and like a weir or a dam it allows the very top surface of the water, the oil or the oily water mixture to fall inside." BP Chief Executive Tony Hayward said the company has "made it clear that where legitimate claims are made, we will be good for them" when asked whether BP was prepared to pay claims to individuals who have lost livelihoods because of the spill. This was the first time the crew had to use its oil-spill recovery equipment. From Louisiana to the Florida Panhandle, containment booms went up around sensitive beaches and coastal marshes, only to be knocked loose by rough seas that also hampered the cleanup offshore. Meanwhile, the growing oil slick moved closer to shore. Some of the sheen began washing up in southeast Louisiana's wetlands. Concern over what would happen to wildlife, fisheries and commerce all along the Gulf Coast grew. A coalition of community groups spoke out before the weekend in Mobile, asking who was in charge. "We're very concerned, and we're kind of anxious," said Leevones Dubose of the Bay Area Women Coalition. "Today is Friday. It's payday. People usually have fun on Friday, and now we're sitting here as if we're waiting on a tragedy." Zack Carter with the South Bays Community Alliance said people were just starting to come back after Hurricane Katrina. "And now we're faced with this other pending disaster. We are asking that the federal government give us a full response this time," Carter said. Many expressed a growing frustration that BP and the government had not been aggressive enough in trying to contain the spill at sea. "We're certainly urging the federal government and BP to deploy more sources to help mitigate the impact of the oil spill that's affecting the coast of our state," said Louisiana Gov. Bobby Jindal. Fending off media comparisons to a Katrina-style disaster, the White House began issuing daily summaries of the government's response, filled with adjectives like "relentless," "coordinated" and "all-hands-on-deck." 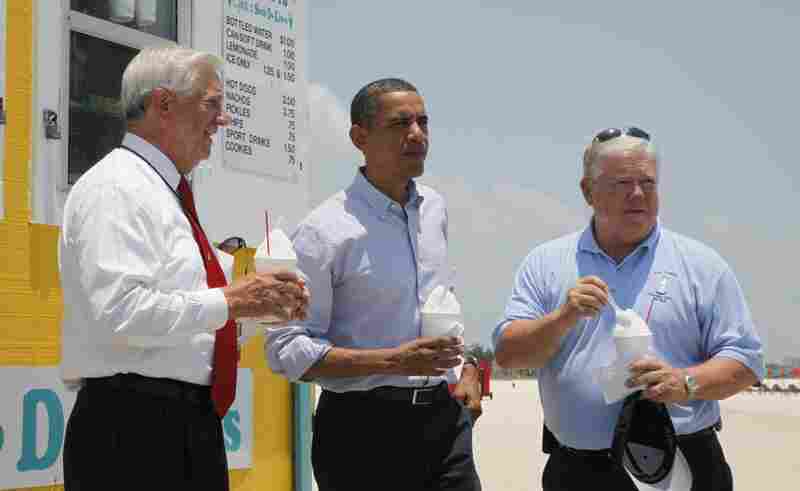 On Sunday, President Obama himself made a hastily arranged visit to the Gulf. With the presidential helicopter grounded by bad weather, Obama drove two hours from New Orleans to Venice, La., where he met with Coast Guard and parish officials. Standing in a steady rain, the president promised to do whatever it takes to restore the region's rich and fragile ecosystem. "This is also the heartbeat of the region's economic life," Obama said. "And we're going to do everything in our power to protect our natural resources, compensate those who have been harmed, rebuild what has been damaged, and help this region persevere like it has done so many times before." But for those all along the coast, the offshore threat is still looming. Volunteer protection efforts have sprung up — from pre-cleaning beaches to building sand walls to block the oil. But mostly, residents feel helpless to stop it. Melissa Bosarge Nelson, who runs boat cruises at Bellingrath Gardens in Mobile, Ala., has lots of questions. "How long is it going to take before it's cleaned up, and how long before it quits pumping? I guess it's the finality of it. They're going to shut the waters and nobody can go out, you can't fish, you can't go in it. And you don't know how long it's going to be," Nelson says. Federal waters from the mouth of the Mississippi to Pensacola, Fla., are now closed to fishing. Looking out over the marshes in Coden, Ala., fourth-generation commercial fisherman Paul Nelson worries that the oil spill could be the end of his family's way of life. "I see something that can't be replaced," Nelson says. "I see something there that we sure don't need destroyed."